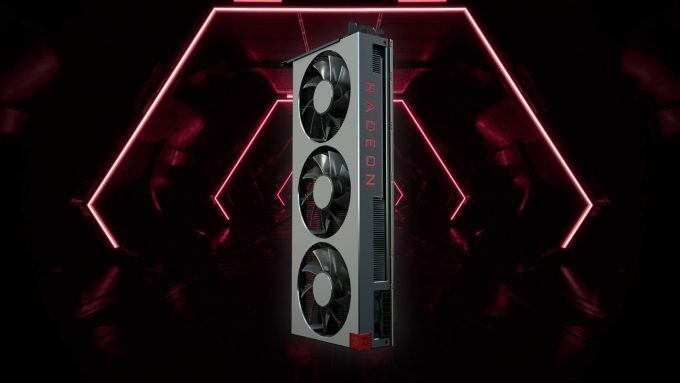 There’s a lot about AMD’s soon-to-launch Radeon VII graphics card that’s intriguing. Announced at CES last week, this monstrous GPU bundles 3840 Stream cores along with 16GB of HBM2 memory that delivers 1TB/s of bandwidth. Based on VII’s specs, it’s easy to assume that the card is a repurposed 7nm Radeon Instinct MI50, and there’s nothing to suggest otherwise (but whether it matters is another story). Given the similarities between VII and MI50, the question of whether or not the gamer variant supported FP64 (double-precision floating-point) lingered after its announcement. At the show, I talked to an AMD rep who said the card didn’t support double-precision, and was further told that such a move would cannibalize sales of the higher-priced enterprise cards (which seems likely). Sitting in an airport lounge last night on my journey home from CES, I almost jumped out of my chair when I found a reddit thread claiming that the card did in fact support FP64. Well, it was either that, or the depressing Indianapolis Colts divisional playoff game. 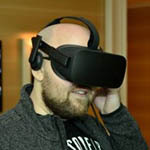 We reached out to AMD’s Director of Product Marketing Sasa Marinkovic to inquire whether or not the FP64 inclusion was real, and were told quite simply that “Radeon VII does not have double precision enabled.” That means instead of delivering 6.7 TFLOPS of FP64 like the MI50, Radeon VII will be closer to ~862 GFLOPS (it’s 1:16 with single-precision like RX Vega). While disappointing to some degree, the inclusion of FP64 on a gaming GPU would be a little strange, and would probably guarantee that everyone but gamers would get their hands on them. FP64 is heavily used where accuracy is imperative, like with simulations and financial analysis. That in turn means that few gamers would be able to take advantage of the feature, so it’s one that’s left exclusive to higher-end GPUs, like AMD’s Radeon Instinct and NVIDIA’s Tesla series. Even with throttled FP64 though, the Radeon VII still beats out the competition in that match-up. NVIDIA’s top-end TITAN RTX peaks at 509 GFLOPS, while the 2080 Ti scales that back to 420 GFLOPS. On the FP16 half-precision front, the 2080 Ti peaks at 27 TFLOPS, while the MI50’s 26.8 TFLOPS FP16 performance suggests Radeon VII will be closer to 28 TFLOPS. It’s important to note that these measurements do not always correlate with real-world performance, especially with software that may be tuned more for one architecture over another (but it’s generally close between vendors in neutral tests). For good FP64 performance, the least-expensive option seems to be NVIDIA’s TITAN V, which delivers 7.45 TFLOPS of FP64 performance. That is unless you can find a circa-2014 TITAN Z dual-GPU card, since its 2.7 TFLOPS of FP64 still beats out every other current NVIDIA gaming GPU. 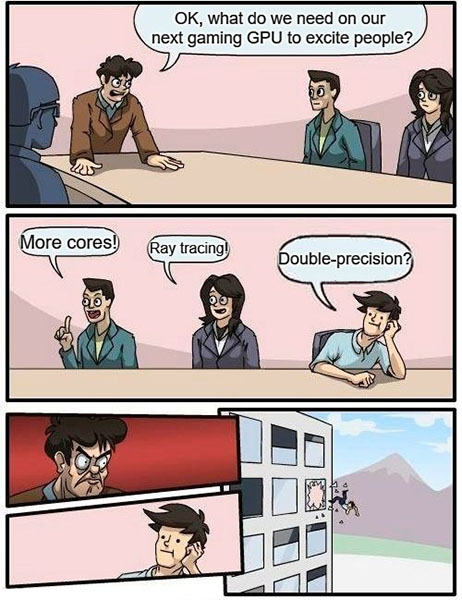 Similarly, the TITAN Black from the same year offers 1.7 TFLOPS. Remember the Radeon 295X2 from the same year? It delivers 1.43 TFLOPS. It’s as if both AMD and NVIDIA were once contemplating opening up FP64 until people were thrown out of office windows for suggesting it. I have many thoughts about AMD’s Radeon VII overall, but I’ll likely save most of those for the actual review next month. All I can say at this particular point is that I am personally more interested in seeing what the card will do in creative workloads over gaming ones. 16GB of HBM2 is pretty alluring, and I don’t think it’d be surprising to see a Radeon Pro VII (or WX 9200?) at some point this year.